The Vario Bell 230 Kit No.2300 construction project. This is Brian McKay's winter project. 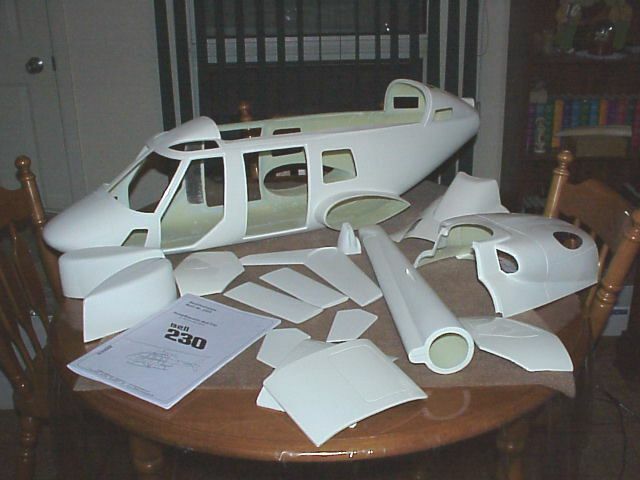 This Giant scale helicopter will be filled with scale details. Check back soon to see this model grow ! 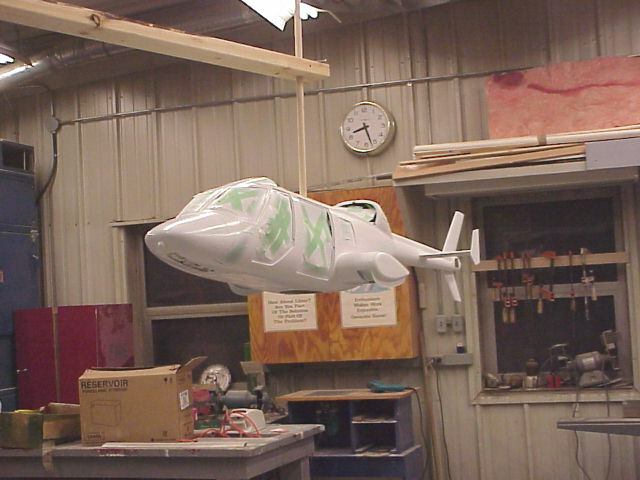 The 230 fuselage after deglazing. Doors and vents cutout. Deglazing was all completed using 400 and 600 grit wet/dry paper with a few drops of liquid detergent in the water as a lubricant. 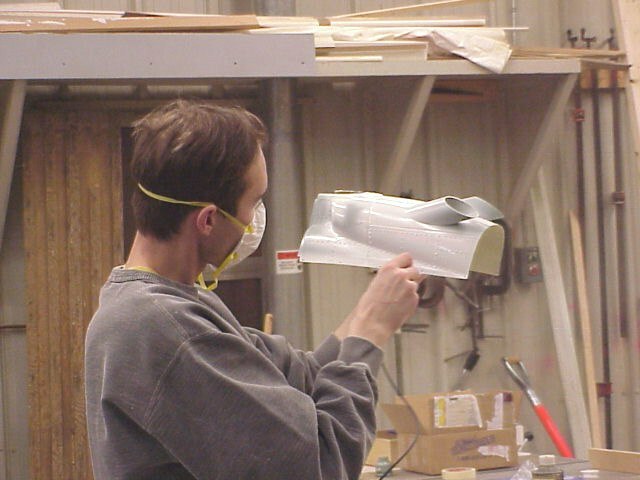 To get to the stage in the picture took 15 hours of steady sanding. Then it took 3 more hours to do the cut-outs. Here we have most of the wood work with the first coat of Sander Sealer applied. You can see the control arm for the front retract, it's masked off for painting. 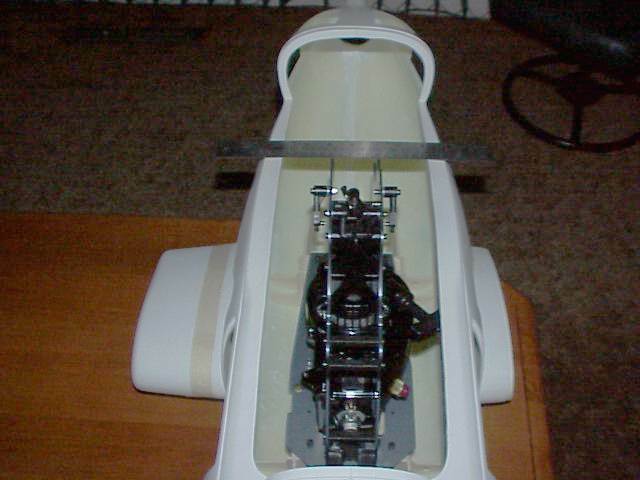 I spent the good part of an evening lining everything up inside the fuse to insure that the output shaft for the tail was a straight run through from the output gear box to the tail rotor gear box. It was accomplished by making sure that the workbench was level and that the fuse was level on the bench. 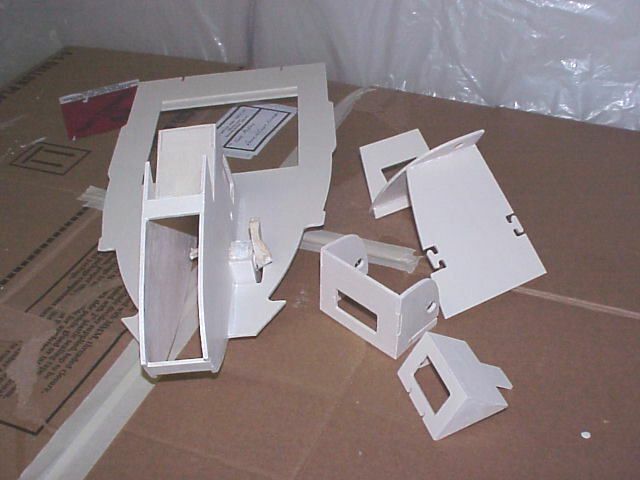 Than making sure that the wood support system in the fuse was also level. The mechanics were then bolted into the fuse and by using two metal rulers I created a site system so that when I looked through the rear fuse opening I could line up center on the output shaft. I then used a couple of small drops of CA to hold the wood frame in place in the fuse. 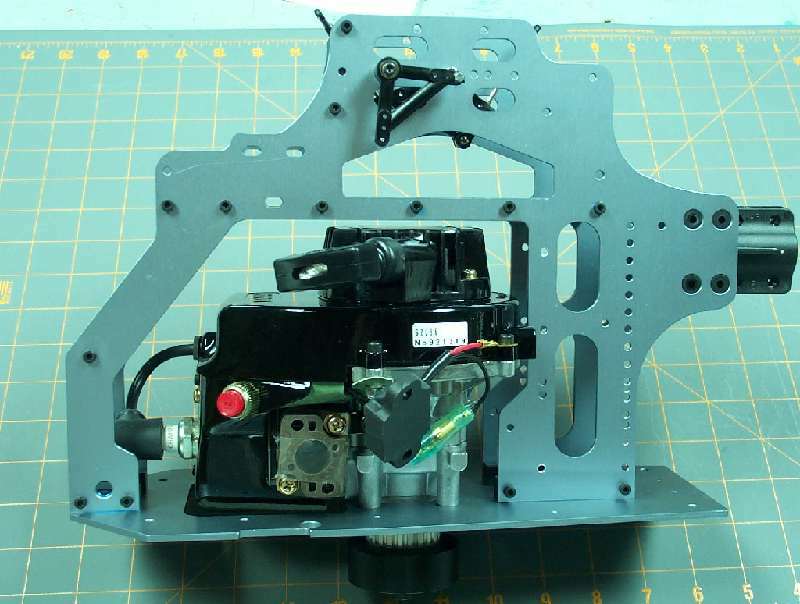 I will now remove the mechanics and epoxy the frame into the fuse, attach the tail boom and the drive shaft should be in a straight line from front to back. Patience is the key to this exercise. 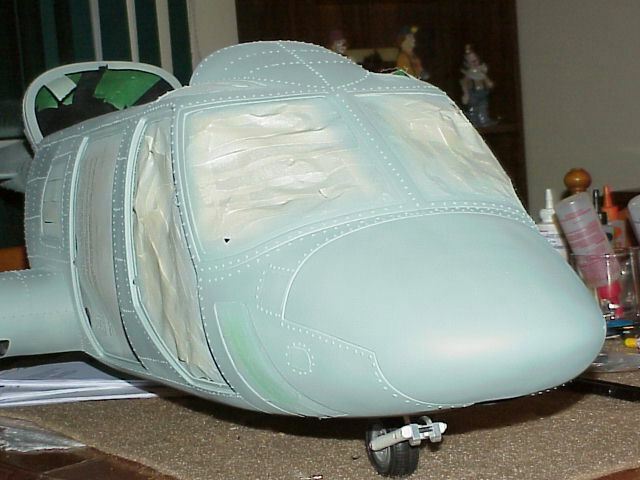 In photo number four I said I was ready to glass in the frame work well I discovered that installing the front lower windows would be near impossible once the flight deck floor was glassed in. I removed the small drops of CA and went back to the drawing board. 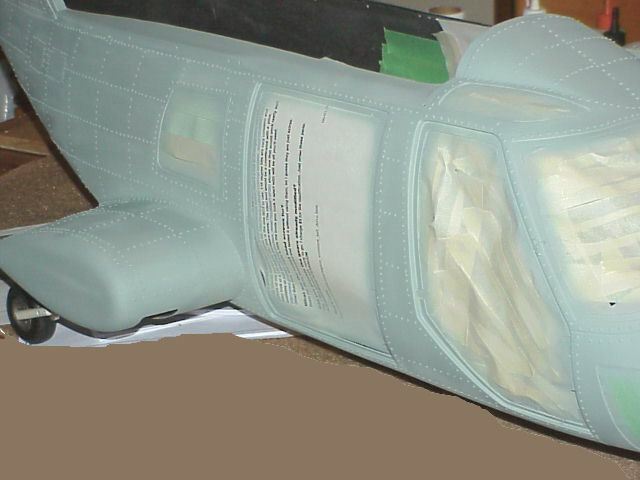 I did all the painting inside the fuse, flat black on the floor back as far as the rear door openings, than flat gray to the rear of the landing gear pods. The flight deck floor was painted flat black on the bottom and flat gray on top, this way when you look up through the lower windows the wood work should be more or less invisible. I than installed the lower windows. Than the fixed gear blocks just in case I should want to install that gear later. Now I'm truly ready to glass in the flight deck floor and the mechanics mounting system. The photo shows the works taped up so I could verify all the clearances around the mechanics. The tail boom is now attached to the main fuse, the system Vario provides insures that everything will line up at 90 degrees to each other. As you can see in the picture a pre drilled disk cut to size goes inside the fuse while in the tail section you have a tab and blind nut. All you do is drill a hole in the glass for the screw, run it into the blind nut and tighten, presto it's all lined up. Following a dry fit and double check I drilled some keying holes for the glue all around the rear of the fuse and the front of the tail section, mixed up a batch of epoxy and pulled it all together with the screw. The epoxy that was forced out was cleaned up with a quick wipe with some rubbing alcohol. Once the glue was set, I reinforced around the fuse disk with glass cloth and epoxy resin. The cooling duct is installed this is fairly straight forward, just a matter of finding the centre on the fan and working from that. 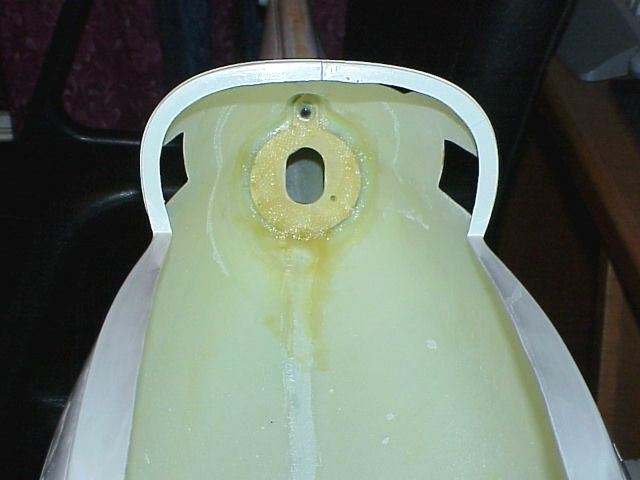 The hole was cut by drilling small holes around the circle than very carefully connecting all the drill holes with a cut-off wheel. 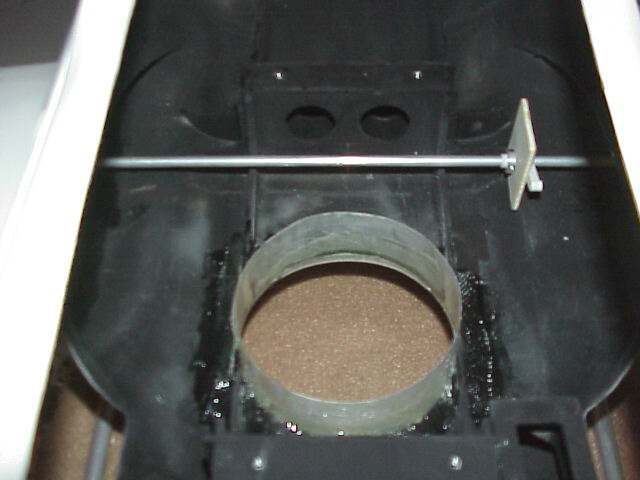 Final sanding was done with a drum sander made to match the 4.75 inch diameter of the cooling duct. 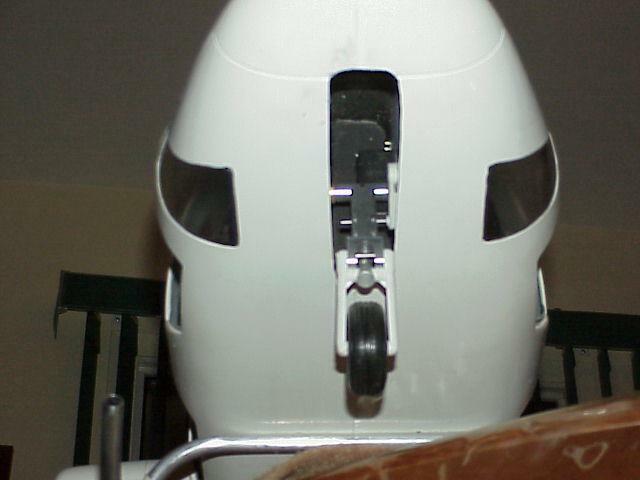 You will note two things one is the strut for the main gear running across the fuse, the other is that the duct is wider than the wood framing. I had a number of options available to me but decided to cut away the wood and reinforce it later. Here you can see the start on the detailing, the process I use is to spray a very light coat of primer sand this out than add my detailing. 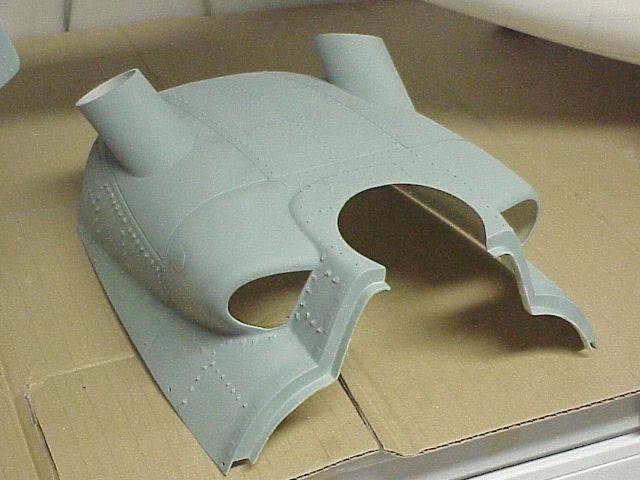 The build up areas around the air intakes was done by masking off the area around where I want the extra thickness to be than I spray a number of layers of primer to create a built up or raised panel effect. The rivets are than added using a medium size medical needle and carpenters glue, once you get the feel of it you can lay down 60 or 70 per minute. Once these have cured I add the final thin layer of primer to lock them in. 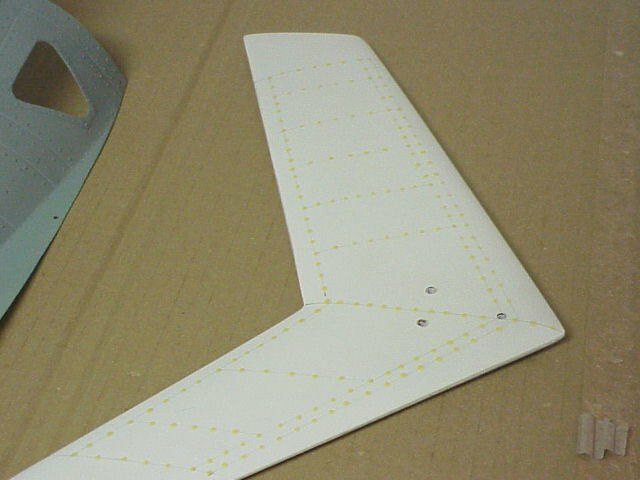 The tail section with rivets locked in with a light coat of primer. The efforts here is really to keep that tail section as light as possible. Because of its really long tail, the 230 needs to be kept light back there to prevent the need to add nose weight later. The rear portion of the top deck with exhaust glued in and rivets and panel lines detailing added. 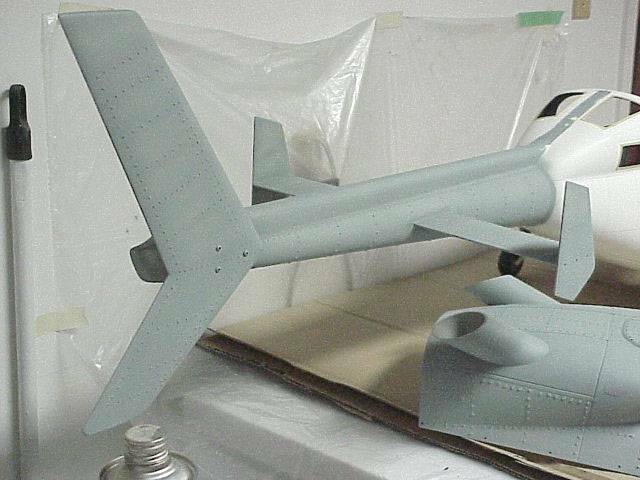 "The final details have been added and the last coat of primer applied, following a few minor touch ups I'll be ready to spray the final color coats. The 230 will be put aside now, I'm going to concentrate on getting the mechanics ready for the test flights as a pod and boom. The next pictures will be of the mechanics in a hover.....I hope!!!" Here it is, the Modified Benzin Mechanics in flight. Yes, that's right we're indoors, the temperature outside is -38.7C while inside it's +22C. The radio is a Futaba 8 Ch.set-up as 4 point CCPM with 6 Hitec HS-925MJ servos, and a CSM 540 gyro. With the gear change the rotor speed is 1200 rpm at the hover. The guy in the background is my son Todd, he has much better reflexes than me for those first flights. 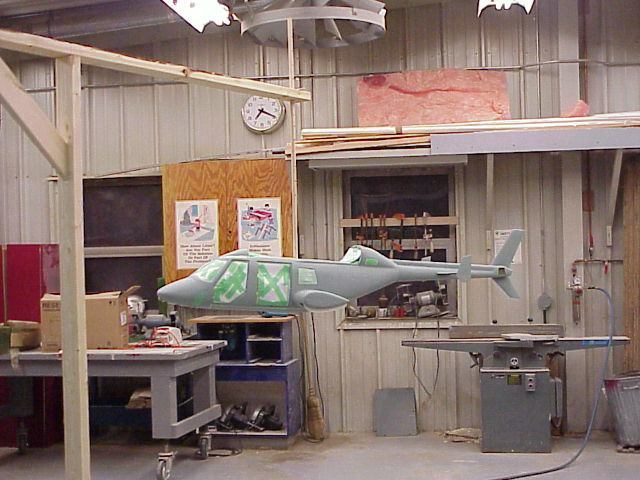 This home made jig is just a way of supporting the helicopter so that painting can be done all around without touching the surface. 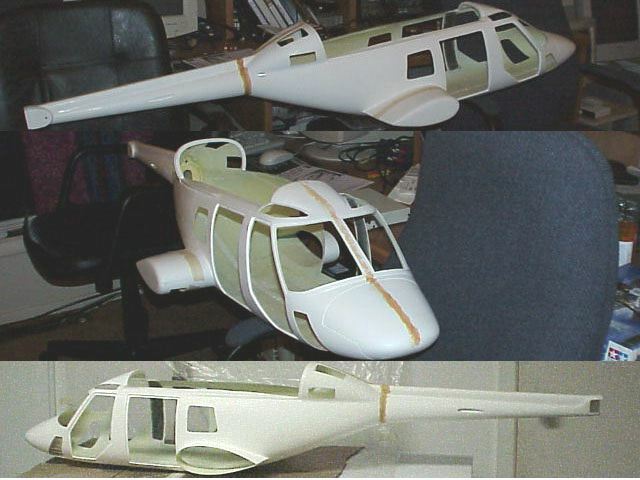 The Bell 230 with its epoxy base coat on. In this case I used Model epoxy paint. This paint goes on easy and is fuel proof. 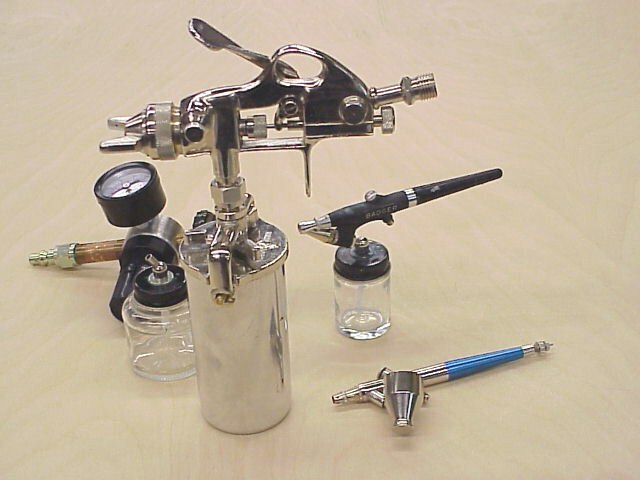 Painting small parts is done with the airbrush.